Confrontation with the US would be a "disaster", Chinese President Xi Jinping has said as he called for mutual respect between the two nations. Mr Xi's comments came at an annual China-US dialogue held in Beijing. Diplomats are expected to discuss China's currency, North Korea and tensions in the South China Sea. The US delegation is led by Secretary of State John Kerry, who in his opening remarks said that the US was not seeking to "contain" China. Mr Xi said the two countries' interests were now "more than ever interconnected", with much to gain from co-operation. "China-US confrontation, to the two countries and the world, would definitely be a disaster," he said. "We should mutually respect and treat each other equally, and respect the other's sovereignty and territorial integrity and respect each other's choice on the path of development." Mr Kerry, meanwhile, said the US did "not seek to contain China" and urged Beijing not to "interpret it as an overall strategy" when the US differed from China on certain issues. US President Barack Obama also said in a statement that the US "welcomes the emergence of a stable, peaceful, and prosperous China". "We remain determined to ensure that co-operation defines the overall relationship," he said. But US leaders have also called on China to do its part in maintaining stability in Asia. Mr Kerry said the US welcomed a China that "contributes to the stability and development of the region and chooses to play a responsible role in world affairs". The talks come with China locked in bitter disputes with several neighbours in the region, notably Vietnam and the Philippines, over claims in the South China Sea. In turn, the US has stepped up joint military exercises with the Philippines and its military presence there, a move over which China has raised concerns. One of the latest exercises was conducted in the South China Sea near disputed waters two weeks ago. Increased anti-Japan rhetoric has also come from China in recent weeks, following a decision by the Japanese cabinet to reinterpret the constitution, giving the Japanese military greater latitude to fight overseas. Both countries claim a string of islands in the East China Sea and ties are severely strained over this issue. The US and China have also had disagreements in recent months, particularly over cyber-attacks. In May, US authorities charged five Chinese military officers with hacking into American businesses. 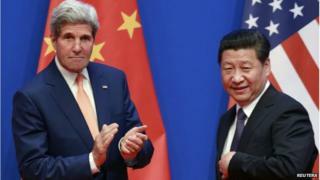 Beijing has vigorously denied the charges, accusing the US of launching cyber-attacks against China. Is Xi Jinping trying to provoke anger against Japan?